Activision CEO Bobby Kotick says he had "no choice" but to fire Infinity Ward co-founders Jason West and Vince Zampella, adding that their betrayal of his friendship was just as disappointing as their alleged professional misconduct. Whether or not Kotick expected a firestorm of this intensity and durability when he removed Infinity Ward bosses West and Zampella back in early March will probably never be known, but two months after the fact he's still dealing with the aftermath. He touched on the topic in a conference call with investors yesterday and while he didn't reveal what exactly the pair did to get booted, he insisted that he had no choice but to act. "The decision to terminate the two executives was not done lightly, and was not done to deprive them of their bonuses," Kotick said. "Nor was it done without a great deal of deliberation about the consequences. We felt we had no choice but to terminate the Infinity Ward executives. We did this to protect the company's assets and the interest of our shareholders." 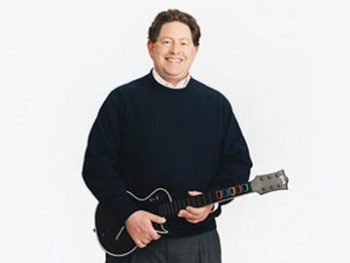 Kotick also claimed to be distressed by their behavior on a personal level. "I personally considered [West and Zampella] friends," he added. "Their conduct was a compromise of our friendship, which was equally disappointing." Infinity Ward remains "the top destination for development talent in the video game industry," Kotick said, although he acknowledged "it is likely that a few more people will leave as well." And although it was difficult, he insisted that terminating West and Zampella was the right decision to make. "There was nothing that would have allowed us to retain their services, as talented as they might have been," he said.